Through the unique lens of “Indigenized environmental justice,” Indigenous researcher and activist Dina Gilio-Whitaker explores the fraught history of treaty violations, struggles for food and water security, and protection of sacred sites, while highlighting the important leadership of Indigenous women in this centuries-long struggle. 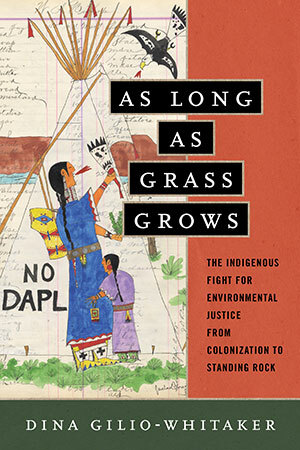 As Long As Grass Grows gives readers an accessible history of Indigenous resistance to government and corporate incursions on their lands and offers new approaches to environmental justice activism and policy. Throughout 2016, the Standing Rock protest put a national spotlight on Indigenous activists, but it also underscored how little Americans know about the longtime historical tensions between Native peoples and the mainstream environmental movement. Ultimately, she argues, modern environmentalists must look to the history of Indigenous resistance for wisdom and inspiration in our common fight for a just and sustainable future.